cdbf,dbf,csv,convert,export,fast,small,win32,linux,unix,cgi,database,php,perl,dbase,xbase. You can select tables for export and set necessary options. It supports 95,2003,2007 Excel formats. 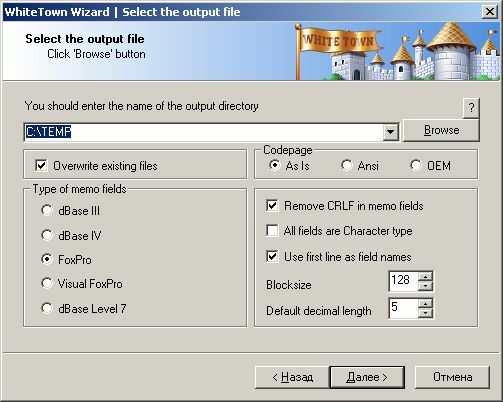 XLS (Excel) to DBF allows you to convert your XLS files to DBF format. It is very simple to use. You can select tables for export and set necessary options. The program supports dBase III, dBase IV, FoxPro, VFP and dBase Level 7 formats. It supports 95,2003,2007 Excel formats. The program supports command line interface. Besides, it includes a DLL which you can use from your own application. rmats. It supports 95,2003,2007 Excel formats. The program supports command line interface. Besides, it includes a DLL which you can use from your own application.